Lei Feng is one of the most enduring figures in modern Chinese culture. The Chinese Communist Party (CCP) has repeatedly held him up as a model citizen. China celebrates a day in his honor every March 5th. And the CCP has submitted an application for him to be given UNESCO intangible cultural heritage status. This post will look at how Lei Feng is commonly represented – and what we actually know about him. More importantly, it will show how and why Lei Feng has become such a big part of Chinese culture. The story of Lei Feng was first introduced to ordinary Chinese in a 1963 speech by Lin Biao, Mao’s top deputy. In Lin Biao’s narrative, Lei Feng was born in 1940. He grew up an orphan as his father was killed by Japanese imperialists and his mother was driven to suicide by a landlord. 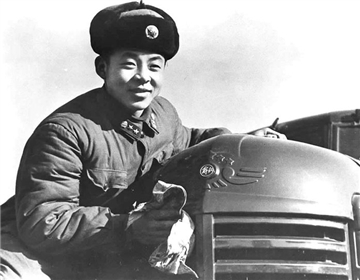 Despite Lei Feng’s suffering, he served his country. He joined the Communist Youth Corps as a child then the People’s Liberation Army (PLA) as an adult. Reading books of Mao’s sayings. Working hard on collective farms. Giving much of his money to good causes. Tragically, Lei Feng was crushed by a falling telephone pole whilst working in the PLA. He died aged just 21. Lin Biao wanted the Chinese to follow Lei Feng’s good example of serving party and country. So his 1963 speech about Lei Feng was not a one-off event. It was the start of a massive 向雷锋同志学习 “Learn from Lei Feng” campaign. Lei Feng’s diary, and pictures of the hero, were released to the public. There was even a Lei Feng museum – where people could see the pole that had killed this revolutionary hero. What’s bizarre about this personality cult, is that it was to a figure who didn’t really exist. Sure, there probably was a soldier called Lei Feng. And he may well have been an orphan who died young. Yet the person presented in the campaign is a fabrication. Lei Feng was not a well-known figure during his life. So it’s bizarre that there are so many expertly-taken photographs recording his good deeds. Especially when photography would have been much rarer then than now. 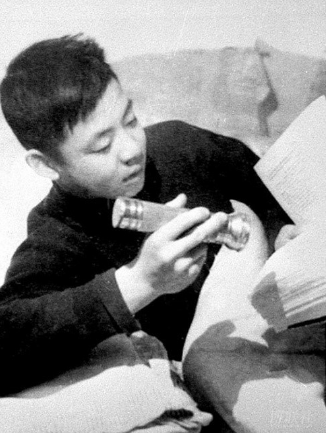 One photograph – of him in bed reading Mao’s works by flashlight – is particularly suspicious. The flashlight is clearly off and the room is fully illuminated. And as a Shanghai designer pointed out, “there just happened to be a photojournalist passing by to capture the moment”. A 200 thousand word diary in very good Chinese is also an incredible achievement for someone with only a basic education. And Lei Feng gave more money to charity than he would have earned from his PLA salary. So, it’s generally accepted in the West that both the photographs and the diary were fabricated after Lei Feng’s death. The entire idea of a Lei Feng who could be idolized was created by Lin Biao and the propagandists working for him. If the idea of Lei Feng was made up by Lin Biao, then it must have served a purpose. To me, it seems that this purpose was to strengthen China’s leadership. Since that initial (successful) campaign, Lei Feng has repeatedly been shown to the Chinese people as a role model. However, he’s often been shown as a role-model for different things. Look at the posters below for an example. The poster on the left is from the 1960s. It shows Lei Feng studying communism and telling people to do the same. The middle poster is from the 1980s when Chinese was becoming a market-socialist economy. It’s promoting a more affluent lifestyle, for example, there’s a TV. But Lei Feng is still there on the cover of the book to offer moral guidance. Then, in the 1990s, Lei Feng came to represent technological achievement. The picture on the far right has monorails, satellites, and even a rocket. Essentially then, he was used to conveying a sense of Chinese patriotism and optimism – regardless of China’s policies at the time. A cynic might also argue that he was used to give legitimacy to the government’s actions. Everyone knew that Lei Feng was a “good role-model” – so assumed that things with his name on must be good too. This is why he’s been associated with some pretty contradictory viewpoints as China’s policies have changed. For example, first supporting communism, then supporting market-socialism. 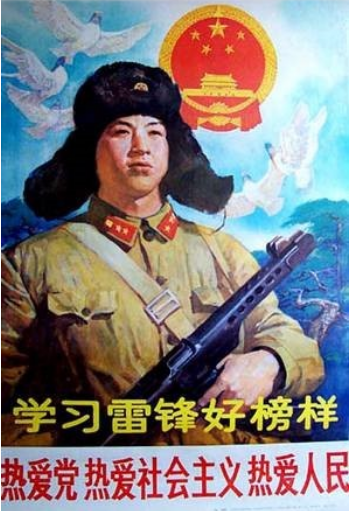 There haven’t been any Lei Feng propaganda posters for a while. But even now the CCP officially acknowledges Lei Feng as a good role model because of his hard work and his devotion. However, they’re not the only ones to reference him: There are several modern brands and products based around Lei Feng. My favorite is a video game where you play as Lei Feng. You do menial tasks such as repairing socks and each time you go up a level, Lei Feng’s clothes become more average. The game ends with Lei Feng meeting Chairman Mao and getting his autograph. There’s also a popular song 东北人都是活雷锋 – “North-Easterners are living Lei Fengs”. You can watch it on YouTube. It’s pretty clear that the Lei Feng who really lived was nothing like the Lei Feng who’s idolized in China. From the very first “Learn from Lei Feng” campaign, Lei Feng was only really a name to whom a list of characteristics could be attributed. Even that list of attributes has subsequently changed. As you saw above, Lei Feng has represented many different things in China’s modern history. However, Lei Feng as an idol is important even so. He’s a piece of propaganda – whose changes neatly reflect the changes in Modern China. He’s a part of the Chinese language – there are several phrases (including some below) that use his name. But most importantly, he’s a key piece of Chinese culture – and one that’s worth understanding if you want an insight into Modern China.